If you're hoping to blow clouds that can reach the farthest heights then you need the Pluto Starter Kit. The Pluto Mod is constructed from durable zinc alloy, ensuring it will endure all the challenges and modifications you throw its way. While boasting up to 80W of output power, It's still compact and portable, not taking up too much room in your hand, pocket or purse. Supported by a 18650 battery, the Pluto Mod also offers multiple protections for safe use and has a temperature range of 200-600ºF. The Pluto Drone Tank boasts a resistance of 0.2ohm and has a holding capacity of 2ml. Measuring in at 24mm in diameter, this tank has an ultra-smooth airflow capability so you can take it easy on your pulls and still blow huge clouds to drift off towards the farthest planets in the solar system. All this is made possible by the generous assistance of the precisely designed S4 Coil. You may never reach Pluto on your own but you can produce thick, tasty clouds that just may have the capacity to reach that distant icy planet, light years away. 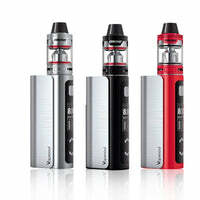 Pluto 80W Starter Kit - Vapesoul has a rating of 5.0 stars based on 3 reviews.